A worship service can be conducted efficiently, but worship can't. It requires time to ponder, reflect and celebrate. Every time I figure out a new way to work smarter, not harder, it’s like finding a $20 bill in an old coat. Shortcuts, life hacks and time management tools are a great blessing, allowing me to get more done in less time, with a higher degree of quality. Efficiency is not just a matter of good work habits, it’s about biblical stewardship. But not when I worship. Or fellowship. A great time of worship is like a great work of art. Or a great relationship. Art, beauty and love are not efficient. Neither are worship, prayer or fellowship. Art, beauty and love are not efficient. Neither are worship, prayer or fellowship. They take too much time. They're too sloppy. They're too important to rush. This is one of the reasons I like small churches so much. Big churches have to be efficient in everything they do. 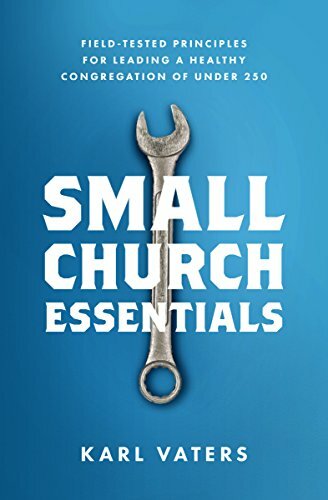 Small churches don’t. When you have hundreds or thousands of people attending multiples services and/or venues, efficiency is essential or the whole thing falls to pieces. But in a small church, you can take your time. Without hundreds of people to corral, or multiple services to coordinate, small churches can relax, slow down and enjoy the presence of God and each other. This is not an excuse for laziness, apathy or lack of planning. A wise church leader knows when to use time efficiently and when to spend it generously. Efficient planning should be used to create extravagant expanses of time for the things that can’t be rushed. Time to pray, not just hear prayer requests. Time to worship, not just get through the song set. Time to fellowship, not just do a turn-and-shake. Time to disciple people, not just complete the curriculum. Time to relax instead of worrying about the clock. A worship service can be conducted efficiently, but worship can't. Worship takes time. It requires whatever space is needed to ponder, reflect, celebrate and linger. We tend to rush through the things we hate, but slow down for the things we love. Our overly-efficient, time-sensitive worship services may be sending folks the wrong message, no matter how great the sermon is.